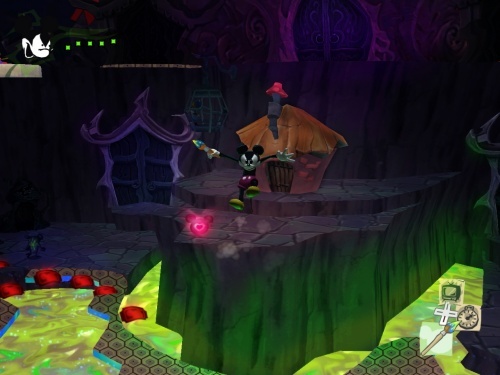 Epic Mickey man Warren Spector says he envisions the game as the first part of a trilogy, but admits that he's had similar ideas for other games in the past that didn't work out quite as he'd planned. "Sequelization" may or may not be an actual word in the English language but there's no doubt that it's all the rage in the videogame industry these days. Many major publishers won't go near a new game unless follow-up releases are almost a sure thing. Yet what comes across as so crass and avaricious when it falls out of Bobby Kotick's mouth sounds more like solid long-term thinking when it's said by Warren Spector. "I don't do anything that isn't extensible. And I will certainly feel like that I have not done my job if we can't make other games in this world with these characters," Spector told 1UP. "In my head, I've got two more planned." It's far from a sure thing whether those games will ever manage to escape the confines of Spector's brain-prison and see the light of day, however, despite the high level of anticipation Epic Mickey has generated. "In the business world of reality, those games have not been approved, and who knows if we'll ever see them," he continued. "I had three games planned for Deus Ex, and you see where that got me."